When it comes to road safety, what most people can think of is to reduce speed of the vehicles. Most of us think accidents will reduce if everyone is forced to go slower. So we sell cars that can easily touch 200 kmph, but fill our roads with speed breakers and enforce a limit of 80kmph on highways, hoping everything will be safe. But real essence of safety lies in "Responsible driving" and in quality infra structure. In this post, I am listing a series of steps, which if implemented, can increase safety on our roads. Below video shows how easy it is to get a driving license in India. Most of the RTO do not have any test tracks that simulate real world road conditions. The tests are always conducted in an empty stretch of road near RTO offices. Unskilled drivers behind the wheels are often the primary cause of most of the problems. 2. Designing practical traffic rules. Most of our traffic rules and restrictions are often designed and enforced without much of a thought. Rules should exist to enable and complement road usage and NOT to prevent the same. Speed breaker: A speed breaker's purpose should be to slow down a vehicle and NOT to bring it to complete halt. But most of our speed breakers are designed such that cars need to stop completely, often breaking abruptly in the last minute because the speed breaker was not visible from a distance. No Parking: While putting up a 'No Parking' sign on a street, police should put some thought where else car owners can park nearby. If there's no space to park anywhere around, car owners will be forced to park in no parking area, as there're no viable alternatives. Speed governors: Enforcing 60-80 kmph speed limit on commercial vehicle is not always practical during inter-city drive. If a one crore volvo bus or truck is expected to crawl at 60 kmph on an interstate highway, bus/truck operator can not do any commercially viable business. So owners will only put up a sticker that says speed governor is installed and cruise at will. Making safer roads and educating all road users is the right solution, not slowing everyone down. Speed limit: How practical is the 80 kmph speed limit on highways? If Govt is very serious about this limit, why let sales of cars that can go two-three times faster? Safe speed limit is a function of multiple things- condition of the road, if there're barricades/service roads, day/night, number of vehicles on the road, safety features in the car and many other functions. On an empty, well paved highway in a good car during day time, even 160 kmph is pretty safe if the driver is careful. On a bad road, even 40 kmph can cause accidents. If speed limit enforcement is not rational, people will ignore it and cruise. We see a sign board saying "Village limit, go slow". Fine. But after crossing village limit shouldn't there be a sign "Village limit ended, feel free to speed up"? Am I supposed to crawl forever after seeing that sign? Overall, it is critical to ensure that rules are practical to obey in everyday life. 3. No reward for those who follow the road rules, no punishment for those who break it. Once practical rules are in place, enforcement is the next step. While obeying numerous traffic rules is a good thing, they end up eating lots of time. Most of us are keen to follow all the rules, but there're others who simply ignore then and get away with it. While you wait 3 minutes for a red light to turn to green, another driver simply zips past ignoring the red light. While you drive around few kms searching for proper parking space, someone else simply parks in no parking zone. While you renew your insurance promptly, many never bother to. A better enforcement of traffic rules- punishing those do disobey and rewarding those who obey can make everyone obey traffic rules. It is easy to blame automobile drivers for every accident. But road safety is a collective responsibility, including authorities, drivers, passengers and general public. Are we encouraging passengers to use seat belt? before opening the car door are passengers checking for any obstacles/oncoming vehicles? Are we encouraging people to cross the road only at designated points and not anywhere and everywhere? shouldn't those who ride bullock carts, cycles etc be trained on basic road safety? Isn't the company that is collecting toll expected to maintain a pot hole free road? A comprehensive road safety initiative should involve everyone, not just drivers. Our police check insurance and license, but seldom inspect if the car/bike is in good condition. 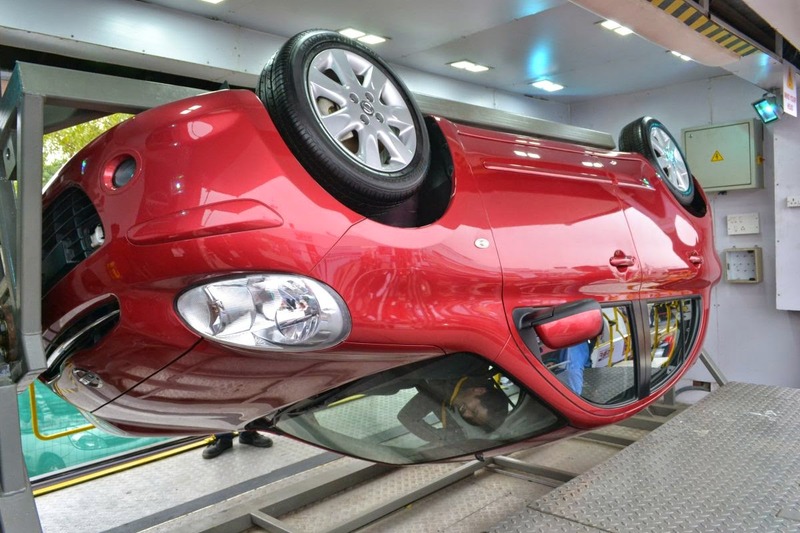 Our car manufacturers give deep discounts to push sales but hesitate to spend on safety gear like ABS and airbags. Airbags cost a bomb to replace, so many car owners don't bother installing a new one. In order to cut cost, structural integrity of the car is compromised and they get poor rating in NCAP tests. These aspects need to be fixed. 6. Changing the mindset: "This will never happen to me"
We do read several accident stories every day, but seldom feel we should be careful. "That was for someone else. It will never happen with me" is what most of us think. Accidents can happen to anyone, irrespective of how careful you have been, how skilled and experienced driver you are and so on. There're multiple factors that contribute to an accident, most of which are not in our control. Being able to predict them and provide a cushion for such probabilities will greatly increase your chances of survival. This is where programs like Nissan Safety Driving Forum are effective. NSDF conducts programs and simulations to increase road safety awareness and educate the public. In order to be safe, you should factor for one or more of these things to happen and be ready to deal with such eventualities. Knowing safe breaking distance in various speed and situations. I agree with the safer driving rules. Although not everyone will follow them, they will still decrease hazards.